Barely a week away from the Sept. 12 event, Apple has released a new developer beta of macOS 10.14 Mojave, the tenth beta of the milestone operating system release. The new build can be downloaded from the Apple Developer Center, or via an over-the-air update for devices enrolled in Apple's testing program. Public beta versions are typically released shortly after the developer betas. 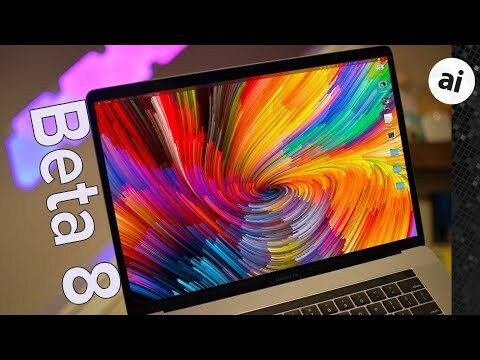 The tenth macOS 10.14 Mojave developer beta is build 18A384a, up from the ninth build, 18A377a. Originally a feature of the Dock, Stacks has graduated to the desktop itself, with macOS Mojave able to automatically sort files and folders into groups, based on type. The Finder has a new Gallery view that shows both media and metadata, with additional contextual quick action links that can be used to perform predefined changes to the files. Quick Look gains access to Markup functions without needing to leave the menu at all, including the ability to trim video clips without using a separate editor. The screenshot HUD aims to make it easier to take images and video of the Mac desktop, with the HUD reportedly also reducing the load on the processor compared to previous techniques. The Continuity Camera function allows for users to insert images into apps directly from an iPhone or iPad camera, without needing to manually transfer it between the devices. An ongoing project to make iOS apps accessible on macOS, the first apps undergoing the treatment are Apple's own, with versions of News, Stocks, and Voice Memos making the transition. The Home app is also ported over, allowing Mac users to manage their HomeKit network from the desktop. The Mac App Store has been given a makeover, one that borrows elements from the iOS App Store, with video previews of apps available to view. Updates for machine learning technologies Create ML and Core ML2 are also included, along with an often-requested Dark Mode UI for the operating system. AppleInsider, and Apple itself, strongly advise against installing beta releases on mission-critical hardware, due to potential data loss. Anyone who wishes to install beta software should do so on non-essential secondary devices, and to make backups of important data before installing. Update: Apple has also pushed out the latest macOS Mojave build for public beta testers. Contrary to what is often claimed by self-appointed tech blog gods the stability of macOS has steadily increased. I have had almost no issues with macOS since Maverick. Sure, there are and have been glitches and annoyances that eventually get fixed but absolutely no show-stopping bugs, nothing that made macOS "useless" as is often alleged. Same goes for Windows these days. My wife has a Windows 10 laptop for her uber-expensive Bernina 830 embroidery machine because the $2500.00 software package that controls it only runs on Windows. All I do is keep updates current and it just works. Did they FINALLY add grouped notifications, ala iOS 12?! I don’t really have my finger on the pulse of this stuff, but have there been an unusually high number of these developer betas this year? Does anyone recall what the average amount of OS X betas released before the GM? It seem the updates are coming more frequently and I believe might mean smaller issues are being fixed and a little spit and polish may soon be in order. I would love to see Mojave in September sometime. You cannot really compare what happened in prior years to what Apple is doing today. The beta releases are coming more frequently because Apple is now following modern software development practices like continuous integration, continuous delivery, automated unit testing, automated build testing, automated regression testing, etc., all built on top of a DevOps infrastructure. The days of "big bang" integration with huge overhead and time/human intensive manual testing aren't happening any more at Apple or any other companies whose success hinges on their ability to deliver quality software quickly, efficiently, and effectively. Releasing betas is so much cheaper and easier when following modern software development practices, Past behaviors and trends no longer apply.